Five years after the Revolution of Dignity the time has come for Ukraine to renew its political elites. Presidential elections will take place on March 31, 2019; parliamentary elections will happen in autumn 2019. Candidates for the post of the President have already registered and the campaign is intensifying. In this context UCMC starts a series of articles about the top candidates for the post. We will be looking at the forecasts through opinion polls as well as at what processes within the Ukrainian society in place five years after the Revolution of Dignity make voters choose a certain candidate. It is key for us to understand what price the country is to pay for electing each one of them. Opinion polling professionals claim: the 2019 Presidential elections are extraordinary. In contrast to all the previous presidential elections, this run does not have a distinct leader, as the number of voters that are undecided is extremely high. Besides, the Central Election Commission has registered a record number of candidates – over 90 persons have submitted registration requests. Results of the latest opinion polls made public on January 31 surprised the society. The polls say the top candidate of the run is actor and showman Volodymyr Zelenskyi. Who is Zelenskyi? What do the numbers that the polls show actually mean? Are they trustworthy? UCMC analyzes the “Zelenskyi phenomenon” in the Ukrainian society and what the price of potentially electing him is. Who is Volodymyr Zelenskyi and why is he running for President? 41-year-old Volodymyr Zelenskyi (born on January 25, 1978) is an actor, screenwriter, producer and head of the “Kvartal 95” production studio. Zelenskyi and “Kvartal 95” parody actual politicians – in a spectacular and witty manner at times, superficially and basing on stereotypes at other times. Sometimes it’s not the meaning or actions of the politicians that they parody but the form, their typical gestures, intonations, language manner or other individual traits. The actor and his project have been on TV for many years and are easily recognizable. 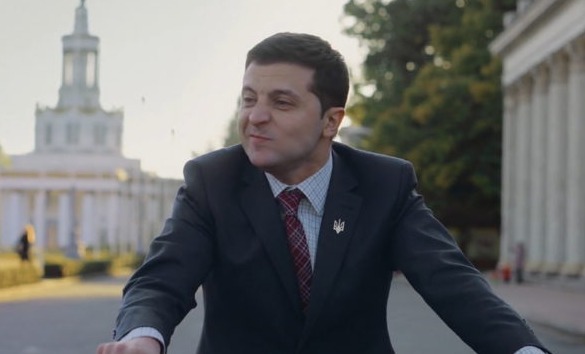 Rumors on Zelenskyi possibly running for President started after the release of the comedy TV series “Servant of the People” (Sluha Narodu) in 2016. The artistic image created by Zelenskyi’s character (a school teacher of history Vasyl Holoborodko who became the President out of the blue and starts breaking the established system of power) has created an illusion of how the problems can be resolved. Ukrainian TV audience saw on screen that the country can be changed by “a good and honest guy” in power. Zelenskyi who starred as the protagonist had to add very little to project this fantasy on real life. In 2017 Zelenskyi’s friends registered the political party “Servant of the People”, it used to be quite virtual until 2019. Holoborodko’s character is not a merely Ukrainian know-how. In 2013 in Italy a comedy named “Benvenuto Presidente!” (Welcome Mr. President!) was released. The film’s protagonist Peppino, or Giuseppe Garibaldi, was leading a quiet life of a librarian in a mountain village and enjoying fishing until when a result of a plot by MPs of the Italian Parliament he was elected the country’s President. Five years before the film was released Giuseppe Piero “Beppe” Grillo founded the populist Five Star Movement (Movimento 5 Stelle) that won the largest share of votes at the latest parliamentary elections in Italy. Grillo is whom Zelenskyi is most often compared to. While it took both Grillo and another politician Zelenskyi’s supporters often quote – Ronald Reagan, quite a number of years to transform themselves from actors to politicians, the Ukrainian comedian has walked this way in a flash: he submitted his registration request to the Central Election Committee while still remaining an actor in the TV series production. Zelenskyi’s main difference from his European fellows is an obvious proximity to Ukrainian oligarch Ihor Kolomoiskyi. Zelenskyi would not be running for President without Kolomoyskyi’s support, despite the latter publicly denying that. Kolomoiskyi has been in a long-standing conflict with the actual President of Ukraine. Poroshenko dismissed him from the post of the head of a regional administration in 2015. In December 2016 Privatbank he owned was nationalized. The bank’s new management stated that its former owners – Kolomoiskyi and Boholiubov transferred offshore about USD 2 billion. The money is subject to a dispute considered by a court in London. Actor Zelenskyi and oligarch Kolomoiskyi are interlinked by commercial interests – TV shows produced by Zelenskyi’s studio are released on 1+1 TV channel owned by Kolomoiskyi. The channel is now broadcasting six projects including the campaigning show of the comedian-turned-politician starting from January 2019. At midnight on the 2019 New Year instead of the traditional New Year greetings by the President the TV channel broadcast Zelenskyi’s address announcing he will run for President. Political journalist Vitaliy Portnikov on air of “Espresso” TV channel voiced the opinion that in the event of comedian Volodymyr Zelenskyi winning the elections, it is actually Kolomoiskyi who will come to power in Ukraine. “If a candidate for this post has no political party or money behind him, he is always part of some other system. If Zelenskyi is part of Kolomoiskyi’s system, the main character of the game is Kolomoiskyi,” Portnikov said. Zelenskyi’s first steps as a candidate show that his take on politics is an extension of the TV show. By the time he made a decision to campaign he had neither experience in governance, nor a political program, nor any vision of what his action plan on the post will be. On January 8, 2019 Zelenskyi suggested to his followers “to write up the program together” by leaving a comment on Facebook, Instagram or via the feedback form on the web site of his Ze!Team (Ze!Komanda). “He may justify even his biggest populist gesture by saying: ‘I am a servant of the people, I do what people have advised me to’,” sociologist Iryna Bekeshkina told in an interview to “Novoye Vremia”. In December 2018 Zelenskyi was interviewed during Dmytro Gordon’s show. When asked serious questions Zelenskyi started talking in a typical manner of a taxi driver who is convinced of being a better expert in governance than any politician. Ukrainian media “Texty” analyzing how truthful the politicians’ statements are, has also analyzed this one. “Seems like Zelenskyi is sincere in what he is saying. It brings us to the conclusion that he does not understand what this war is about. He suggests a rational option to solve the problem applied when two states have disagreements that can be negotiated. In our case negotiating is not possible, as this war with Russia is about our physical survival,” the media concludes. According to political expert Oleh Saakyan, the interview in question became a huge mistake on the part of Zelenskyi’s team. “It would have been worth extending the pause, the intrigue and keep using the image created by the TV series ‘Servant of the People’ and by the aura of mystery. He would have benefited much more not from a campaign that would deliver meaningful messages but rather from the one transmitting emotions and directing them with humor, flash mobs or creatively staged rallies,” the expert told TVI channel. The number showing considerable support that Zelenskyi is potentially getting may well be demonstrative of the lack of trust to the political class that gets many Ukrainians to cast their vote “for fun”. To many voters it is enough that the candidates curse or make fun of the authorities to win their support. Iryna Bekeshkina, the director of the Ilko Kucheriv Democratic Initiatives Foundation, in an interview to “Novoye Vremia” explained: “The Zelenskyi phenomenon is quite simple to explain: people are very disenchanted in all politicians and in politics as a whole, it pushes them to look for the candidates beyond the system. Sixty six per cent of voters say new persons are needed. (…) Zelenskyi, Vakarchuk and leader of “Nashi” (Our People) party Yevhen Murayev were some of the persons that voters named. Who else can be there? These are well-known people, it is logical. A comedian, a singer – these are the people constantly seen on TV. Those not appearing on TV cannot get such share of support by default. Those seen and accepted get a high share,” Bekeshkina said. The sociologist also emphasized that Zelenskyi’s electorate is mostly youngsters. Young people are unreliable voters, their turnout is smaller. So the actual support that Zelenskyi may get on the voting day may return much smaller numbers than expected. Not taking the “Zelenskyi phenomenon” seriously would also be careless. Political expert Volodymyr Fesenko compares Zelenskyi to the U.S. President Donald Trump and warns against the “phenomenon repeating”. When Trump kick-started his presidential campaign, he was taken seriously by a few. It did not though get in the way of him winning the elections. On January 31, 2019 a group of three organizations conducting public opinion polls that are closely monitoring the course of the election campaign in Ukraine – Center for Social and Marketing Research “SOCIS”, Kyiv International Institute of Sociology (KMIS) and the Razumkov Center, released their ranking. The ranking based on the opinion poll held between January 16 and 29, 2019, among the voters intending to vote that made up their mind, 23 per cent support showman and comedian Volodymyr Zelenskyi. The actual President would get 16,4 per cent of votes and the Batkivshyna party leader Yulia Tymoshenko – 15,7 per cent. At the same time the same opinion poll shows that 20,5 per cent think Petro Poroshenko is likely to win the elections, 19,9 per cent see Tymoshenko winning, while the victory of Zelenskyi is the outcome that 10,8 per cent see as real. The numbers reconfirm that at least half of Zelenskyi’s voters are guided by the protest mood. “Rating” group published their data on the same day. It shows that those ready to cast their votes for Zelenskyi at the Presidential election are 19 per cent from within the voters that have made up their mind and intend to vote. Tymoshenko is supported by 18,2 per cent of such respondents. The actual President of Ukraine Poroshenko is on the third place with 15,1 per cent of votes. According to the “Rating” group 23 per cent of respondents see Tymoshenko the next President. The victory of Poroshenko is what 16,3 per cent expect, 10,3 per cent go to Zelenskyi. The difference between the two opinion polls is obvious and at times goes beyond the margin of error. What does it say? Uchoose project that UCMC is implementing spoke to Andriy Horbachyk, dean of the faculty of sociology at the Taras Shevchenko National University of Kyiv and board member of Ukraine’s Sociology Association. The sociologist explained: “Opinion polling is conducted by representative sampling. (…) Within the sample there is always a margin of error, always. If we choose sampling, we accept the margin of error. So even in theory all surveys have a margin of error of about two per cent. (…) This presidential election is extraordinary, it has no distinct leader. Forecasting when one candidate has 60 per cent of the ranking is one thing, while when there is a two-four per cent difference between all of them and 40 per cent of voters are still undecided, this tiny difference may change to whoever’s benefit on the voting day. The key question is – what awaits the country if Zelenskyi is elected the President. It comes obvious that in the best-case scenario the power will be in the hands of Holoborodko – a “good guy” from TV with unpredictable actions in reality. It’s no secret that on the political arena in contrast to the set he is drastically lacking experience, knowledge and competences. Media outlet “Vox Ukraine” that was fact-checking the politicians’ statements throughout 2018, claims that only one of the five statements Zelenskyi made in the interview to Gordon, turned to be truthful, while the knowledge of economy, relations with Russia, the Minsk agreements and of the current events in Ukraine in general that he demonstrated was extremely superficial. Holoborodko is not the only scenario for Zelenskyi. Quite a number of times the politician expressed himself in a despiteful, vulgar or a scandalous manner on the country’s sovereignty – what he actually must be protecting if chosen President. His jokes about Tomos infuriated Ukrainians. “Skhemy” (Schemes) investigative TV show proved he went on with his business in Russia after the war started. The scandal in Jūrmala in 2016 when Zelenskyi compared Ukraine to “an actress of a German film for adults” sparked indignation with millions. In his recent interview to “Ukrainska Pravda” (Ukrainian Truth) Zelenskyi jokes that he does not rule out a one-round election scenario as April 1 (April Fools’ Day and the next one after the election day) would not be a bad day for electing a clown as the President. Nevertheless March 31 may become a good day for Ukrainian voters. For those to have seriously confessed to sociologists today they sympathize with Zelenskyi it would not be late to say at the polling stations: “we were joking”.